Our North Miami Beach Personal Injury Attorneys have represented hundreds of people that have been injured in both North Miami Beach, Florida and throughout the state by no fault of their own. Our lawyers are available by appointment to meet with you at our North Miami Beach office, your home, the hospital or at a location that is most convenient for you. 2. Our attorneys will take all necessary steps to preserve all available evidence from the scene of the accident. Preservation of evidence could require obtaining photographs of the scene, videotaping of the scene, obtaining statements from any witnesses, obtaining police / accident reports, obtaining video surveillance from any cameras surrounding the scene of the accident, and immediately hiring experts to investigate the accident scene. We have an on-staff investigator that is responsible for accident scene preservation. Do You A Have Case? In 95% of the North Miami Beach, Florida accident cases that we handle our accident attorneys can tell you within a matter of minutes whether you have case. The best way to know if you have a case is to call us for a free phone consultation. Whether you are a North Miami Beach resident or were injured in North Miami Beach, our attorneys are available to discuss your recent accident. The personal injury division of our law firm only represents the injured and we never represent insurance companies. We have assisted clients with accident and injury claims against every major insurance company and most of the world’s largest corporations. We encourage you to view some of our resolved cases and client references are available upon request. 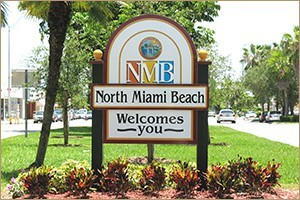 North Miami Beach is located north of Miami Beach and east of downtown Miami. As the younger brother to busy Miami Beach, North Miami Beach is a unique and growing community of its own. It is the location of many shopping centers, businesses and residential areas. This prime beach front location is an easy drive to the metropolitan centers of Miami and Fort Lauderdale. Many Miami Beach residents commute to work via US-1, the Dolphin Expressway and Interstate 95. In 2008 alone, there were 60 crashes which led to 64 fatalities in the Miami-Dade portion of I-95 alone. Additionally, due to the year round tropical climate and miles of beaches, residents enjoy an active lifestyle, including motorcycling, bicycling, running, and other outdoor activities. Haulover Beach is a major location for boating, water sports and fishing. At times, these activities can turn dangerous and regrettably, accidents do occur. To serve the large population, there are many hospitals in the city, including Jackson Memorial Hospital and Mt. Sinai Hospital.